Below is a list of some of the writer sources that we use at 98toGo, and a number that we yet to try. Finding a writer on each site might require following a different process, so it’s important to acquaint yourself with the website/source as you conduct your search. Zerys is a writer marketplace and platform that gives brands tons of options when it comes to finding a writer for a project. They cater to both marketers (working inside brand) and agencies (working on behalf of a brand). Hiring writers will run you about $0.01/word up to $.50/word, which translates to a 1000 word blog article costing $10 - $500. That’s a wide price range, which means there’s a good chance you’ll find a writer that fits your project’s budget. Here’s a link to their pricing page. - The new Z3 platform is great. Specifically the editorial calendar feature, and the ability to quickly assign articles with a very specific word count and short turn around time. - Zerys has a ton of writers in its network, and with some digging you can find top notch writers that fit just about any project. - Zerys’ support staff is superb. They are incredibly fast, knowledgeable and take the frustration out of technical issues. - Searching for new writers can be a tedious process. Because there are so many writers with so many different areas of expertise, finding the perfect writer can take some time. But this is the case with most (if not all) writer marketplaces. 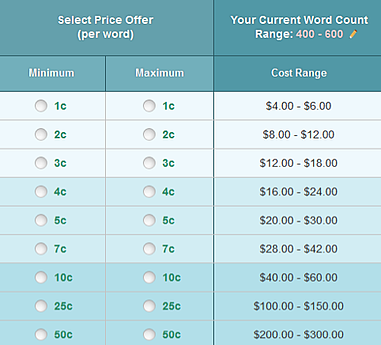 Pricing starts at $0.02 per word, and goes up as high as $2.00 per word. That means for a 1000-word article you can pay between $20 - $2000. Here’s a link to their pricing page. They have a nifty pricing calculator that helps you get a better idea of how much you’ll pay for content. So we took it for a spin to see how much a 1200-word article (this is around the current recommend best practice length for content marketing) would cost from a 5-star writer (if you’re not seeking top quality content then reevaluate your reasons for publishing content in the first place). A 1200-word article from a 5-star writer will cost $96.70. - The casting call process for finding writers is great. It makes finding a writer quite simple: you put out a job and writers can only apply to write for you if they are qualified. - The rejection process is very tedious. If you order a piece of content and need to send it back for any reason (which happens when using hired writers), you must go through a lengthy process which involves detailed write-ups of exactly where in the article the writer missed the mark. This is incredibly time consuming, especially when, as in our case, you’re developing content for a client. Scripted is an online content marketing place that allows you to hire freelance writers for: blog articles (long and short), whitepapers, Tweets, Facebook posts, website pages, email newsletters, press releases, or video scripts. For a piece of “no expert required” content, you’re paying $49. For a piece of content from an “Expert writer”, you’re paying $99. Here’s a link to their pricing page. Contently is a bunch of things. First, it’s a content platform for brands that helps them create, optimize, and publish content. You can find freelance writers, along with a host of other freelance content professionals. It’s also a great place for freelancers themselves to set up shop, showcase their work, and attract new projects. I even have a profile in Contently. Finally, it’s a blog that regularly publishes compelling, thought leadership content about content marketing. Prices are not openly listed on Contently. Writtent is a writer marketplace where you can find content writers for all sorts of different types of projects: from blog posts and whitepapers, to newsletters and tweets. According to their website, Writtent has a pool of 350+ writers to choose from, presumably vetted and quality. There are three tiers of pricing on Writtent: Basic (3-4 cents per word), Advanced (6-8 cents per word), Pro (10+ cents per word). Here’s a link to their price page. Most people familiar with Copyblogger do not know them as a source for finding a writer, but rather as an authority in content marketing. However, in July 2014 they announced the first graduating class of their Copyblogger Media’s Certified Content Marketer program. Effectively, they are vouching for the quality and professionalism of a handful of pre-screened writers who are available to hire for your projects. Copyblogger gets paid when people sign up for their program, so any content rates are negotiated between you and the writer you identify. It looks like all interaction between you and the writer you’re interested in takes place outside of Copyblogger (meaning, you reach out to the writer independently and discuss your project). This program seems to be new and it will be very interesting to see how it evolves over the next few months. But because it’s backed by Copyblogger, you can imagine that all of the writers are quality and will return some top notch content! It seems that pricing for content is worked out between you and the writer. MediaBistro produces content on the media industry, and provides journalists and brands a way to do business together. They have both a Freelance Marketplace and a Job Board where brands can go to find top quality talent for a number of different project types (including content writing). Using the Freelance Marketplace to find a quality freelance writer is free (you only need to set up an account). Posting on their Job Board does cost money, and that starts at $279/job. Here’s a link to their pricing page. JournalismJobs.com is just like the name implies: a job board for media professionals looking for journalism jobs. They also give brands the opportunity to post jobs as well. Searching for jobs is free (this is more for the writers themselves). As a brand, posting a job costs $75/ad. Here’s a link to their pricing page. Most likely you are very familiar with LinkedIn and have an account. But it’s not commonly recommended as a way to find talented content writers. But why not? Most likely, writers are peppering the Internet with profiles that showcase their work, and LinkedIn is not different. There are a few techniques that I suggest using when searching for a content writer on LinkedIn. You’re going to want to be very specific in the type of writer you want, the topics you want them to be writing on, and their experience. Identifying groups for finding content writers is another good strategy. Here’s an article I found with some other tips. Searching through writer profiles on LinkedIn is free. You’ll want to have a profile yourself so that you can connect with and reach out to potential talent. There are other options to finding writing talent on LinkedIn. You could post a job about the talent you’re looking for; you could create an ad and target it at the member type you’re looking for; or you could upgrade your account to a Premium account which will give you more access to user information that will help you locate writing talent. So there are a few options when using LinkedIn. ProBlogger.net is a site that helps bloggers grow their blogging business. The founder, Darren Rowse, is an expert on the topic of profitable business blogging, and his site is followed closely by those wishing to turn their blogging hobby into a profitable career. Along with articles on blogging, ProBlogger also has a job board where brands can post jobs and find talent. Posting a job costs $50, and that job will run for 30 days. Here’s a link to their job board where you can get more information. 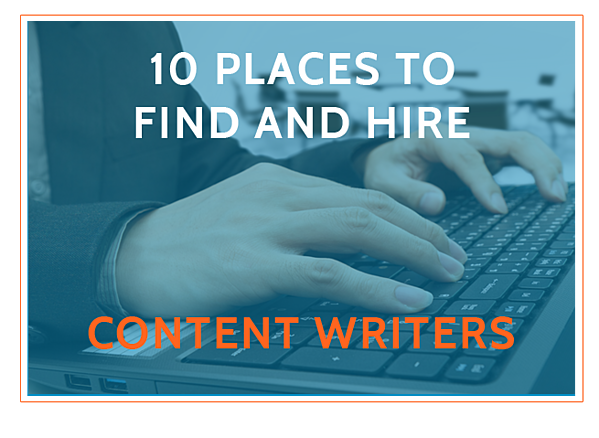 We’ve covered 10 different sources for finding and hiring talented content writers. Some of the sources have similar processes and features, while others are different. The bottom line is there are many routes to finding a writer who’s a good fit for your company’s operation, budget, and time constraints. Have you ever used any of the sources mentioned here? If so, what was your experience? If you use another source not mentioned here, please tell us in the comment section below.